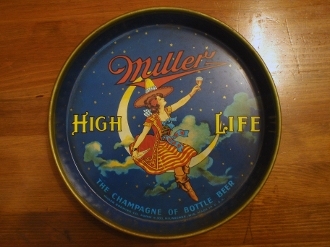 Miller High Life beer serving tray 12" diameter. Miller 'Maid in the Moon' beer tray featuring the Moon Maid in her great multi-cultural costume & sombrero, offering a toast to the cosmos with the 'Champagne of Bottle Beer - Miller High Life!' Maker marked Miller Brewing Co. in Milwaukee, Wisconsin circa 1950s. Will display nicely.